As I hinted earlier in the week, today I have an extra special FO to talk about! I’m happy to be part of the Blue Sky Alpacas blog tour for their new yarn, Extra, and its accompanying set of patterns: the Destination Collection. Photo copyright Blue Sky Alpacas. Extra is an Aran weight 2-ply yarn with a nice, tight twist. It comes in generous 218 yard skeins and somehow manages to feel both lofty and deliciously dense at the same time, likely due to the fiber blend. It’s composed of 50% baby alpaca/50% Merino wool, which makes it 100% Fiasco-approved. Only the finest baby alpaca for my fella! The Destination Pattern Collection was designed specifically to highlight Extra and was “inspired by hometowns, far-away places and everywhere in between”. I chose to knit the Tokyo Tower Bandana designed by Olga Buraya-Kafelian. It’s an interesting cowl/shawlette hybrid, similar to Carina Spencer’s Zuzu’s Petals (which we know I love), but with an entirely different construction. I was completely surprised by the layout of the pattern, I had never seen a pattern set up like a fold-out map before. I’ll admit that at first I was dubious (It’s so big! How am I supposed to read anything?!) but by the end of the project I loved how the layout folded up rather conveniently so only certain parts of the pattern were showing, and there’s no denying its visual charm. 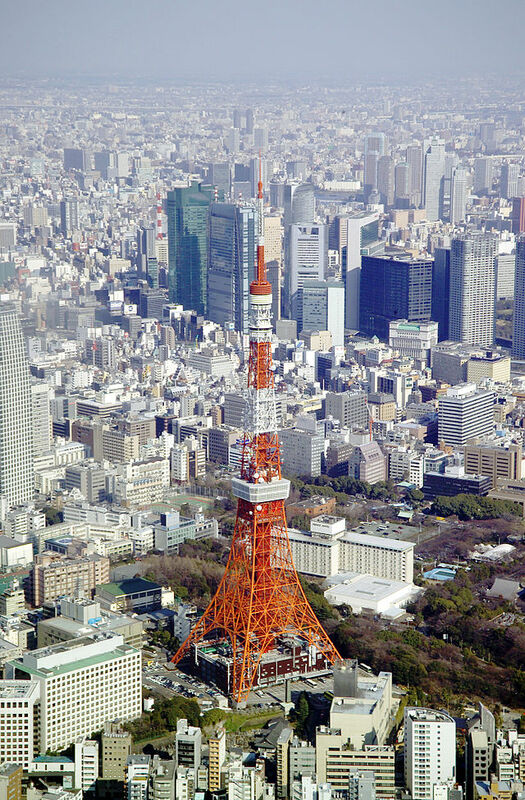 As the name suggests, the lace on the bandana was meant to emulate the Tokyo Tower (pictured above). Truthfully, the lace detail is a bit minimalist for my taste. I’m much more of an ornate-leaves-and-flowers type of gal and less of a stark-urban-jungle dweller. It does, however, capture the vibe of the real life tower pretty well. The cowl begins in the round from the top with a simple garter stitch hem. It then transitions to a plain stockinette section with some increases down either side of the center back. After some time, a garter section is knit and then bound off. The rest of the bandana is then knit flat with decreases on either side forming the long triangle until the final stitch is closed off at the point. I generally dislike following patterns with written-only instructions, I always end up wishing for a chart or for a more efficient use of stitch markers since I hate counting stitches on every row. Despite that, this was an enjoyable knit and fairly flew off my needles because the yarn was amazing to work with! It snagged a bit from time to time on my pointy needles but it was generally sleek, smooth, soft, and delightful to touch. It worked up into an incredibly even fabric that blocked very well. and follow the steps to leave a comment and follow me on Twitter, share a Tweet, or like my blog page on Facebook for additional entries. (If for some reason the link doesn’t work, just leave a comment below and I’ll enter you manually.) The giveaway is open to all (US & International) and ends at 11:59 pm on Thursday, October 2. I will choose and announce the winner next Friday. Thanks for playing along, and thanks so much to the folks at Blue Sky Alpacas for the lovely yarn, pattern, and prize! Aaaaaaaaaaaaaaand last but not last, please check out the rest of the blog tour! A different pattern and color yarn will be highlighted at each stop, with a chance to win prizes at each! This entry was posted in cowls, FO, FOFri, giveaway, knitting, review, yarnaholic and tagged giveaway, knitting, review, yarn by shoelaceswitcher. Bookmark the permalink. Beautiful cowl. Looks great on you. Love the color and the story behind the design. Vancouver, BC in winter was pretty “cool”! I love the Pacific NW and sure miss it now that I live in the Midwest. I haven’t traveled much. Although I have seen quite a bit of this country. I now live in AZ and really, the Grand Canyon has to be the most amazing place. Ooooh that’s high on my list of places to see sooner than later! I haven’t traveled a lot but Hawaii has to be one of the best vacations I’ve had. Not sure whether I entered the Rafflecopter thing correctly, so, commenting here as well. The neatest places I’ve ever been were Mont-Saint-Michel and the little city of St. Malo, near the tail end of a high school trip to France. They’re both a bit of a tourist trap, but they’re breathtakingly beautiful tourist traps, with amazing architecture and views of the ocean. Even the endless souvenir stands seemed to be selling higher-quality items than the usual plastic tchotchkes. I can’t wait to go back someday! The coolest place I’ve visited is probably Venice Beach, Florida. The water is beautiful, and the beaches have lots of shells and occasionally shark teeth. I can’t travel any more due to severe illness. I wish I could visit Wales and see Yr Wyddfa and Ynys Mon. I will have to look into that pattern since I loved make ZuZu’s Petals. And who wouldn’t adore alpaca!!! Neatest place I ever visited? Treste in Northern Italy. Oh look at the colorways! If my stash wasn’t too big to store right now, I would definitely get some for myself! I love how pretty the FO turned out, you have perfect stitches! Thanks, but the evenness of the fabric is really due to the yarn, I couldn’t believe how neatly it knit up! I went to Canada years ago and loved it! I like when I went skiing in the Poconos. It was a very nice time of the year. Melbourne, Australia was the coolest place I’ve travelled to, probably because it was for my honeymoon. I have travelled extensively, but think I’d choose Jerusalem, an exciting, diverse city that pulsed with energy. The coolest place I’ve ever travelled is probably Denman Island, BC. Where’s the coolest place you’ve traveled? I haven’t traveled much, but the best place I’ve been to would have to be San Diego, California. I love the bridge, the ocean, and the Needlecraft Cottage was my first local yarn store (not big box). Coronado was also beautiful. My ex-husband and I were stationed there for a time. He hated it, but I loved it. What a relief, I’d just commented on an old post so this was here all along! Love that cowl – it looks like the perfect shape to me!